Advances in tile manufacturing in the past few decades have improved the quality and choices available to consumers. New colors, new materials, larger format, thinner tiles and digital printing have all contributed to a steady growth of the use of tile as a surface. When compared to other flooring options such as carpeting and wood floors, ceramic tiles are normally preferred because they are easy to clean, resilient, and hygienic. Unfortunately ceramic tile and natural stone, if not installed properly, are subject to cracking, delaminating, and are cold to the touch. Use of electrical floor heating can minimize the cold, but can submit the tile assembly to additional stress that can lead to cracking and delaminating. Traditionally most electric floor heating, and anti-fracturing membrane manufacturers have recommended covering the electrical heating cables with a self-leveling cement layer or a thin-set layer followed by an uncoupling crack isolating membrane and then finally installing the tiles. This process needlessly increases time, difficulty, thickness, height differentials, weight, and cost of the overall installation. In keeping with our commitment to offering the finest and latest radiant heat technologies, Warmzone announces the offering of Prodeso® membrane floor heating systems. 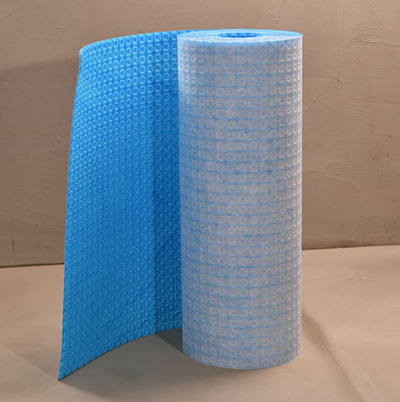 The Prodeso membrane is a polypropylene uncoupling, crack isolation, waterproofing membrane, with rounded square shaped reliefs. These reliefs form channels specially designed to embed and hold the ComfortTile heat cable – and is an excellent choice for heating tile floors. The heat membrane features a polypropylene thermo welded woven underneath to increase the bond between the subfloor and the membrane, and comes in rolls that can be laid out directly over the subfloor prior to the ceramic tile or other floor surface being installed. The design of the membrane provides an innovative uncoupling and waterproofing system for heating floors and other surfaces without movement or expansion joints in the screed. Simplifying the installation process, the uncoupling membrane is laid directly over the entire surface intended for the installation. The electric heating cable can then be installed in the channels formed between the rounded square reliefs of the patented membrane, resulting in quick, easy, and accurate cable placement. It is NOT necessary to use self-leveling cement to cover and protect the heat cable before starting a tile installation. This results in significant savings of material, time, cost and overall weight. The floor surface can be immediately installed over the membrane and cable. The membrane is versatile and can be used on all types of indoor and outdoor applications. And the Prodeso system is safe under all conditions and weather, and can be used to heat a wide variety of floor surfaces. It even waterproofs the substrate in the case of overlaying on cracked or imperfectly cured floors with a risk of vapor stress. Warmzone’s Prodeso® Heat System combines the benefit of an underlayment membrane with the comfort and convenience of electrical floor heating. The Prodeso Heat Membrane can be installed over the entire subfloor as an uncoupling, crack isolating and waterproofing membrane. 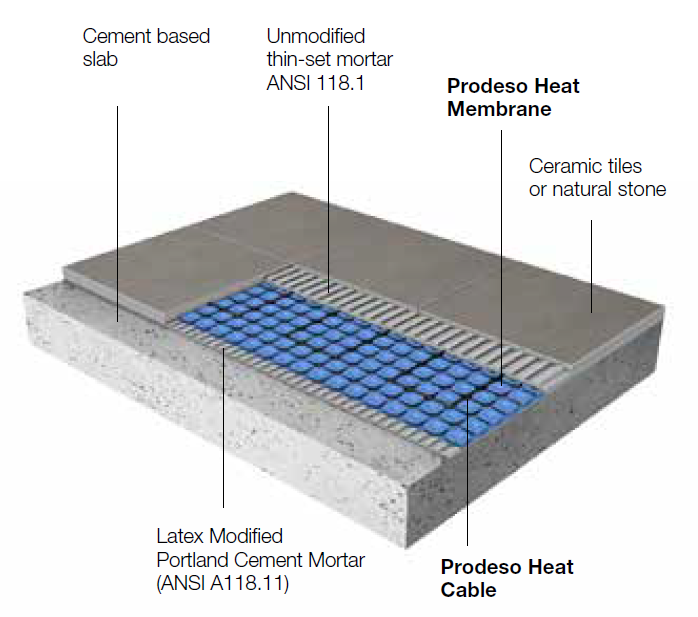 The innovative and patented Prodeso® heat system is a time saving, cost effective system to install a warm and comforting floor. The floor heating cable is then installed in the channels of the membrane, ensuring quick and accurate cable placement. Once the heat cable is installed you can begin installing the flooring immediately; no waiting is necessary. This allows you to install an underlayment membrane, the floor heat and tile (or other surface) all in the same day. The Prodeso heat system will add only 5.5mm to your overall installation. That’s less than a ¼ inch, which is considerably less than many other leading systems. There is virtually no heat loss, making this floor heating system extremely effective and energy efficient. 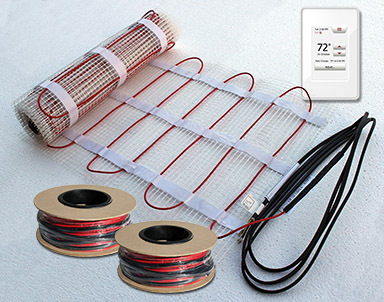 The patented Prodeso heat system allows you to have the comfort and convenience of under floor electrical radiant heating at an affordable cost. Prodeso heat system thermostat allows you to program and control your floor heat cycles to accommodate your schedule, optimizing comfort and minimizing operating costs. The system gives you the pleasure of under floor heat where you want it, when you want it. The Prodeso heat system is an easy to install floor heating solution, and comes with a 10-year limited warranty. To ensure the maximum benefit from your Prodeso floor heating membrane, it is recommended to use ComfortTile floor heating cable. ComfortTile heat cable is a premium, proven heat cable that is used for a wide range of radiant floor heating applications. The quality manufacturing is evidenced by the twin conductor heating cable that is matched with premium materials, enabling the ComfortTile heat cable to withstand the harshest conditions while providing superior floor heating performance and fast response times. The heat cable is only about 1/8 of an inch in diameter, and can be quickly and easily placed in the channels of the Prodeso membrane.